As an Extraterrestrial life form, pinkcat@pinkwork™ city is so curious about humans and this physical world. This time my interest turns to Gnosticism, an early form of Christianity which still has the doctrine of reincarnation, karma, mediation ...etc. Three "abducted" humans (for my research) are Dreamonita (celebrity dream interpreter / columnist), Arumimi Hifumi (director of Performing Arts@Skyhigh) & Zeke Li (theater creative director / gnostic believer) . 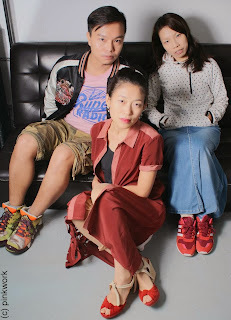 Zeke just produced the very first gnostic theater drama "The Gnostic Eden" in Hong Kong last year.